This stunning property located in the exclusive inlet of Jupiter Island in Florida is the home of Celine Dion, who custom-built the mega mansion in 2010 for $20 million. 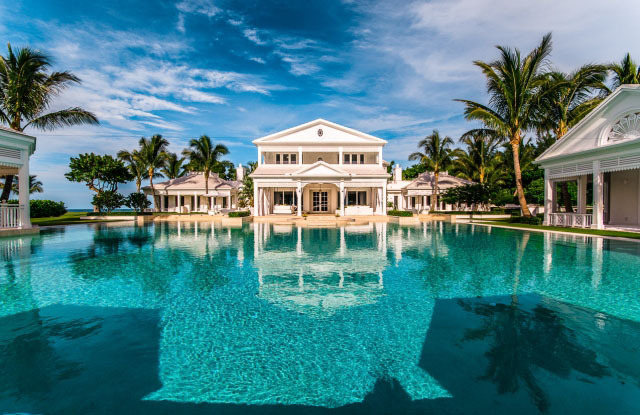 The Bahamian inspired estate is now listed in 2013 for $72 million which includes almost of its contents. The 5.5 acre property with over 415 linear feet on the Atlantic Ocean is comprised of the main residence and 5 individual pavilions including a guest house with 8 bedrooms; a tennis house with simulated golf range leading to the tennis court; a pool house with built-in grill and separate kitchen; and a cozy beach house with second floor sleeping loft and massage room.